Mr. Fussell is represented by Marler Clark, the nation’s food safety law firm, and Rainey, Kizer, Reviere, and Bell, a respected Tennessee firm. On March 19, 2018, Tatum Carey purchased a salad from the Chick-Fil-A located at 615 McCallie Avenue, Suite 107, Chattanooga, Tennessee for her fiancé, Chandler Fussell. The salad contained romaine lettuce contaminated with E. coli O157:H7. Three days after consuming the salad. Mr. Fussell began experiencing stomach cramps and nausea. The following day his symptoms escalated to severe diarrhea and additional gastrointestinal symptoms. On March 25, Mr. Fussell sought medical attention from CHI Memorial Hospital in Hixson, Tennessee and from there was transferred to the downtown location in Chattanooga where he was admitted for further treatment. At the hospital, Mr. Fussell was diagnosed with hemolytic uremic syndrome which escalated into kidney failure. As a result, Mr. Fussell required multiple plasmapheresis treatments and remained in the hospital almost two weeks. In the hospital, Mr. Fussell submitted a stool sample that tested positive for the E. coli O157:H7 strain linked to the multi-state romaine lettuce E. coli outbreak stemming from the Yuma, Arizona growing region. Mr. Fussell’s E. coli infection has left him with permanent injuries requiring ongoing medical treatment. “Since the Spring of 2018 we have been doing the traceback from the restaurant to the growing that the FDA refuses to be transparent about,” said Marler Clark managing partner, William “Bill” Marler. “Our goal in this case is to find out where the lettuce was grown and determine what could have been done to prevent this,” added Marler. 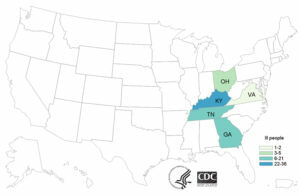 To date, Marler Clark has filed eight complaints in relation to the nationwide E. coli O157:H7 outbreak including this complaint against Papa Murphy’s, along with one in Georgia against Texas Roadhouse, one in New Jersey against Panera, one in Pennsylvania against Freshway, two in Arizona against Red Lobster, and an additional two in California against Papa Murphy’s. Marler Clark currently represents 95 people sickened in the outbreak, including 12 who developed acute kidney failure. On April 10, 2018, the CDC announced an investigation into an E. coli O157:H7 outbreak stemming from romaine lettuce grown in the Yuma region of Arizona. There were a total of 210 confirmed cases across 36 states, with 96 hospitalizations and 5 deaths. Marler Clark currently represents 87 people affected in the outbreak and has filed 12 lawsuits associated with the outbreak. Health officials noted the cases were found in children and teenagers with an “extensive exposure to fast food”. On April 11, 2018, Eunice began to experience gastrointestinal and other symptoms including nausea, vomiting, diarrhea, stomach cramps, fever, fatigue, and headache. On April 13, 2018 at 4:57 PM, Eunice presented to UC Davis Medical Center, where Abigail Jo Scheitlin, NP, and Ian Michael Julie, MD, evaluated her in the emergency department for diarrhea. In triage, Eunice reported a three-day history of abdominal pain accompanied by multiple episodes of diarrhea and nausea. She thought her symptoms might be related to her recent consumption of Chinese food. Eunice described her abdominal pain as stabbing and rated it at 10/10 on a 1-10 pain scale. It was aggravated by movement and relieved with rest. Eunice thought she was having fevers, but she had not measured her temperature. She also had shaking chills. Eunice did not notice any blood in her stools, although she thought one of her stools looked red that day. She could not think of any illness exposures, and she had not traveled recently or taken antibiotics. She had no previous history of these kinds of symptoms. On exam, Dr. Julie found Eunice afebrile but with a slightly rapid pulse of 91. Her abdomen was tender and exhibited rebound and guarding. While under observation in the ER, Dr. Julie started Eunice on intravenous fluids and sent blood to the lab for analysis. She was given Zofran for her nausea, as well as a low dose of Dilaudid. He also requested a CT scan of her abdomen and pelvis. At around 9 PM, radiologist Eugenio Gersovich, MD, performed an IV-contrast-enhanced of Eunice’s abdomen and pelvis, during which he identified diffuse wall thickening and mucosal hyperenhancement involving the cecum and ascending colon. He thought this looked like colitis, which could be infectious versus inflammatory. Dr. Gersovich saw no evidence of acute gallbladder inflammation or appendicitis. He did observe a moderate amount of free fluid in Eunice’s abdomen, which he thought was probably related to the findings in her colon. After Dr. Julie received the CT results, he requested a stool sample to check for C. difficile and other enteric pathogens. He started Eunice on IV ceftriaxone (Rocephin) and metronidazole (Flagyl) empirically while waiting for stool study results. He conferred with the hospitalist service to admit her to the hospital for continued observation and treatment. At 10:44 PM, Runalia Bahar, MD, formally admitted Eunice to the hospital, noting her labs were relatively benign except for anemia. Her electrolytes were slightly out of balance and indicated metabolic acidosis, so Dr. Bahar added PlasmaLyte to her IV fluids and repleted her potassium and magnesium as well. Although the CT scan was concerning, Dr. Bahar chose to stop Eunice’s IV antibiotics after the initial dose. Her admission diagnoses were “colitis, favor infectious,” with a question of bloody diarrhea. Her anemia was thought to be due likely to heavy menstrual cycles, by history, but they planned to measure her blood counts serially. On April 14, 2018, Olivia Campa, MD, came in for the medicine service, finding her stable but still uncomfortable. Eunice’s white count was elevated at 13.3K, but her metabolic panel showed stable kidney and liver function and her anemia was unchanged. Eunice was unable to tolerate even a clear liquid “diet” and continued to have frequent watery diarrhea. A stool sample was finally collected at 5:47 AM and sent to the lab for culture. A text for toxigenic C. difficile returned negative results. Saturday, April the 14th, I started to throw up because of the medications I was taking such as morphine. After a while, I did not accept the pain medications because they were making me feel worse. The nurses tried giving me medications for the nausea but those did not work. It honestly felt as if nothing was working. The pain was not getting any better and I could say my biggest fear while being in the hospital was dying. Nothing was working and at first the doctors were unsure what was going on with me. The pain was now all across from the lower right side to the lower left side of the abdominal area. To have a pain that bad with diarrhea and vomit and not knowing the cause of it was pretty scary. I could say once the pain got to its worse point, it was very difficult to walk. My fiancé had to help me get up and back on to the bed whenever I needed to go to the bathroom. I went through CT scans as well. Eunice’s exam on the 15threflected an increase in her right lower quadrant abdominal pain; however, she no longer exhibited peritoneal signs. Dr. Campa decided to restart Eunice on Rocephin and Flagyl as she was not improving and was perhaps worse. Eunice continued to suffer from nausea, vomiting, and right sided abdominal pain overnight, so on the 16th, her CT scan was repeated. Her abdominal exam exhibited an increase in tenderness, with positive rebound and guarding. At 2:15 PM on April 16, 2018, radiologist Ramit Lambda, MD took Eunice for a repeat CT scan, after the administration of IV contrast. Dr. Lambda thought the appearance of her colon looked worse, again seeing a moderate degree of inflammatory thickening with edema of the colon, extending from the cecum to the proximal descending colon. His diagnosis favored an infectious process, given the length of time these findings were present and the absence of rectosigmoid involvement. The current CT also identified associated ascites, but without any free intraperitoneal air to suggest a perforation. Eunice’s doctors continued her IV antibiotics (Rocephin and Flagyl). On April 17, 2018, Eunice was feeling somewhat better and was able to tolerate a very small amount of oral intake, although this was followed by “some” nausea and vomiting. Her abdominal pain appeared to be improving, with a decrease in rebound tenderness, and she continued with IV antibiotics. Her temperature was high normal at 99.2ºF. At 11:31 AM, Eunice underwent repeat abdominal imaging (digital x-ray), which correlated with the CT findings on the 13thand the 16th. However, things did not look worse, and there was no free air in her abdomen. On April 18, 2018, the hospital laboratory finally had preliminary culture results from Eunice’s stool collected on the 14th, which showed growth of Shiga 2 toxin positive E. coliO157. The lab reported Eunice’s STEC infection to the health authorities and sent the isolate to the county health laboratory for confirmatory culture and serotyping. Dr. Campa came in to see Eunice, who was now tolerating crackers without nausea and vomiting. She continued Eunice on IV antibiotics. Going through this illness affected my ability to spend time with my family and friends. I wasn’t able to attend a funeral that I really wanted to go to, from my family that was going on that Saturday because I got sick. Once my family and friends knew I was in the hospital they wanted to come visit me there but because of constant diarrhea and vomiting I couldn’t have them there. It was embarrassing to me to have to always go to the bathroom while people were there visiting me. So I only had very few close family visit. I think my family and friends are more aware of where they go out to eat now because of seeing me in the condition that I was in. I’m also more aware of where I go out to eat and I do not eat salads anywhere anymore. I’m still traumatized by the illness that I’m just scared to eat anything outside of home. When I was hospitalized, I was worried about my future. I was supposed to get married this year but because of being hospitalized, I lost the appointments I had set up for the locations I wanted. So, my wedding had to be moved for next year because the location got booked. Overall, I just want the party at fault to know they should take more precautions about ensuring the food they sell is clean. Going through an illness that bad is horrible and traumatic especially when it could’ve resulted to kidney failure or death. The causal link between Eunice Cintron’s confirmed E. coli O157 infection and romaine lettuce she consumed from Chick-fil-A is clear. Eunice ate contaminated romaine lettuce in a salad on April 9, 2018, purchased from the Chick-fil-A located in Sacramento, California. Eunice began to experience symptoms consistent with E. coliinfection on April 11, 2018. An exposure on April 9 is consistent with the average E. coliincubation period of 48 to 96 hours. A stool specimen collected on April 14 tested positive for E. coliO157 at the UCDHS Specialty Testing Center. Further genetic testing determined that Eunice’s E. coli infection was a genetic match to the Yuma, Arizona romaine E. coli outbreak strain (PFGE pattern EXHX01.0047/ EXHA26.0626). Given Eunice’s confirmed infection with E. coli O157, her exposure to romaine lettuce, and the genetic evidence connecting her infection to the outbreak, Eunice was identified as a confirmed E. coli case in the Yuma, Arizona romaine E. coli outbreak (Outbreak ID 1804MLEXH-1) by the Sacramento County Health Department.